Cartridges are colored according to the type of contaminant they remove from the air. 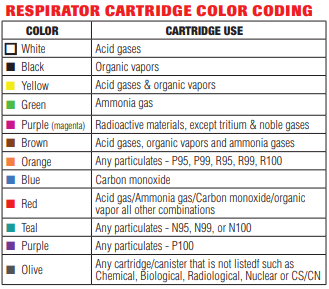 Refer to the tables below to determine the appropriate color of cartridge for your needs. The table on the left contains colors of respirator cartridges commonly used when handling pesticides. The table on the right has the full spectrum of cartridge colors.